by cultivating the early careers of scholars of color. The Policy Academies envisions a more equitable and just society brought about by policy decision-making that is fully informed and shaped by the people and communities most directly affected. Help us relaunch and expand this powerful program! 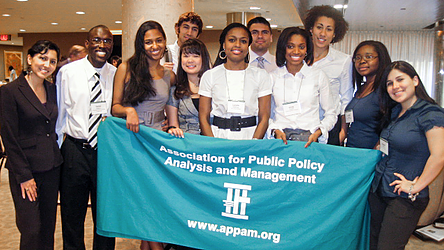 We promote the individual career success or our Fellows and Alumni - by training and cultivating pipeline of public policy scholars of color to help define, investigate, and propose solutions to the social equity challenges of our time. We build on-ramps and connections for researcher of color, targeting those who are mainly first-generation college-goers. We leverage institutional expertise and resources, and connect leading policy institutions to a diverse talent pool. We will transform the field and ultimately the policy conversation by cultivating a critical mass of researchers and analysts of color and connecting leading policy research institutions to enhance diversity and inclusion efforts across the field.